A large grouping of anti-cuts and corporate tax campaigners from the Trades Council, Notts SOS and swelled immensely by the support of students and education workers on the other anti-cuts and fees protest in town on 4th December 2010, got Vodafone shutters closed down again (one on 3 seperate occasions on Clumber St.) as Nottingham’s contribution to the continuing UK Uncut days of action took place at Clumber Street and all around the city centre. Two Boots stores and Topshop were also targetted. Click on photo to enlarge the walk through one Boots store. More media, reports, opinions: See photos on NSAFC website. Watch Video of Nottingham protest at one Vodafone shop, at St. Peter’s Gate, on YouTube. Read Notts Trades Council report. Read article and watch video on Notts Indymedia. Read article written for Coalition of Resistance site [Word] [PDF]. It should be noted that the recent bailout in Ireland included keeping corporation tax at present levels but to cut the minimum wage, showing that we are indeed paying for the banking and general capitalist crisis. Cuts, low corparate taxation and low wages are the state solutions to economic crisis and obviously fully endorsed by HMRC. Shareholders are also responsible as their dividends from the profits of these companies are in relation to the money saved on tax avoidance (and from exploiting workers who make the goods or work in their stores). On the same day of this protest it was on the news that Kraft who recently acquired Cadbury are moving a large part of its business operation to Switzerland to avoid paying UK tax showing that this is part of a ongoing strategy by global corporations to avoid tax with the full collusion of governments. 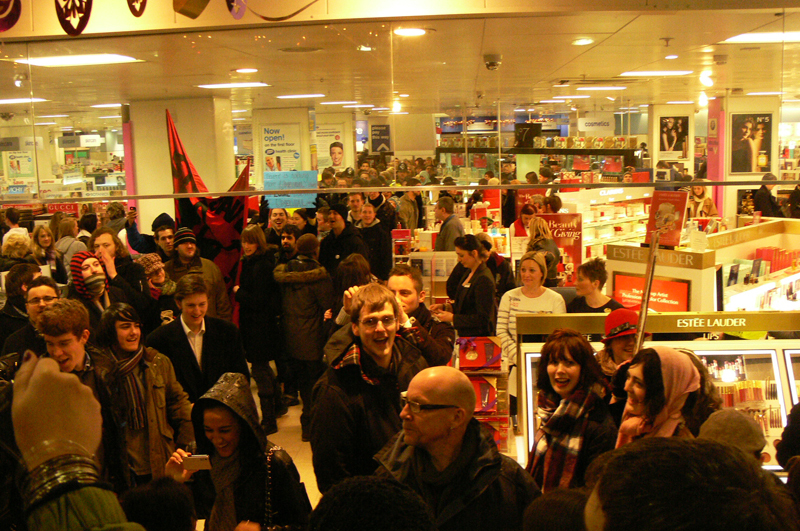 In London: Press release: Flagship Topshop Closed Amid National Protests Against Tax Avoidance. Many more actions took place around the country and are set to continue. See also: UK Uncut protesters spied upon by undercover police (reported day before, 3rd Dec, Guardian). Watch Video of March through Nottingham city centre. This entry was posted in Events & meetings, Road to success and tagged city, demonstration, police, tax, video. Bookmark the permalink.